Silk scarves and shawls give off that sincere and elegant look that complements diamond or any accessory. So woman naturally flock to these garments not because of their display but because they naturally complement and accentuate the colors they have on and even their skin tone but what also uncontrollably calls a woman to a silk a shawl or scarf is the fact that its handmade and crafted to show the desire women would like to see in all their garments. Silk is handmade and hand dyed because if how delicate the material it can be. Each stroke of the artist’s brush is a stroke of passion for art and a passion to see what women have desired in a delightful garment. The artistic view silk scarves and shawls exhibit is that they are seen to have sense of calmness and serenity. Though there are some that are done explicitly for art shows that would show the artist desire for it not to be worn but to exhibit his or her mind only to be viewed handmade silk allows the artist to say that a person is clearly wearing their art work. 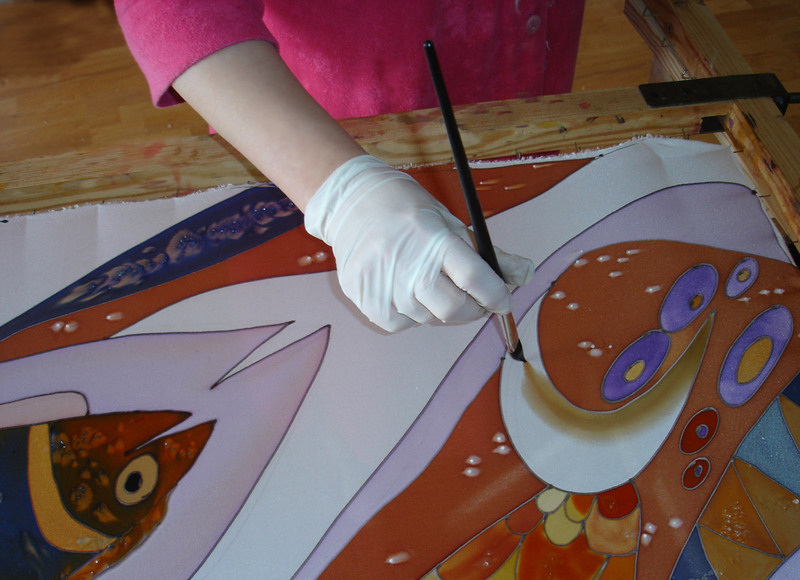 In making hand painted silk shawls takes a great deal of time and patience that allows the artist to practice each time his or her brushes the delicate and soft silk. Painters use their canvas to convey their ideas and desires for the artistic world which is the same for the silk painters covering their canvases with silk to convey the same idea. When you first look at a piece of art the first thing do you think of is how much value it could come to worth or the creators purpose. When viewing silk scarves the simplicity of the art work would only allow a person to think of its prints but the process is not always simple as copy and pasting a bunch of prints. Silk scarves are not to only be seen as a sense of fashion or that one piece that allows people embrace the art work from generation to generation to see another piece to be viewed. Silk becomes an artist canvas. For centuries most notably in the Far East silk has had a sensual meaning and beauty that inhibits the wearer. Even with women known as Geisha’s who were introduced to the western culture, were notice not only for their beauty but their garments that draped their delicate yet classical bodies. Silk was to not only inspire a woman to have that high ranking in society but also be the one to wear such art sought out by many of their time. With silk garments like kimonos one was able to see the beauty of flowers, or trees, any environmental element or even animals depicted with such clarity you would think a woman was caring it as a miniaturize on the back of her garment. If you read about the cultural fashion from three decades ago you can see the importance of silk and how it was seen as a prized possession not only for its worth but the silk scarf or shawl or dress was seen to hold that artist gift. A gift that was shared each time he or she created an individual piece for an individual woman. Although there can be prints placed onto silk scarves hand made silk shawls and scarves, if noticed, hold the most value. Not that they cost the most but that they hold a connection to that artist who wanted to share his or her love for the art of painting silk. It’s not every day a person can say that they’re a silk painter, and love the art forms that they have to share to the world and its ever growing sense of fashion. Today silk scarves, and shawls and garments seem to speak elegance and give off another artful sensation in the fashion world. You can see the craftsmanship in each stroke and each pick up of the brush. This exemplifies the great care that goes into silk scarves and silk shawls. Handmade silk scarves show an artist’s love and care into the making of such a garment. The canvas becomes the silk and the scarf becomes one of a customer’s very own. It is truly wearing a piece of art. And if in search of such rare beauty womensclothingtoday.com display some of today’s rarest. Although handmade silk scarves are can be considered fashion and a piece of art to that artist who created it would be considered first and imagination and that was so willingly placed onto a canvas that would soon be a human being to wear and show the world that beauty in silk prevails. Silks are luxurious fabrics, delicate in an aesthetic sense yet practical and durable. With the proper care, silk scarves and shawls can be enjoyed for a lifetime. Unfortunately, since imported silk is often sold by weight, an old process of “weighting” woven silks with metal salts has given silk a reputation for poor durability. The metal salts coat the silk fibers, making them heavier and thus temporarily more profitable to sell, but later causing them to disintegrate and shred, creating a dry rotting effect that was blamed on mold, mildew, sunlight, and aging. Now that this “weighting” process is (for the most part) illegal, silk has proven to be very resistant to the various molds, mildews, and rots that plague other natural fibers. Even though silk is very resistant to de­cay, it should be stored in a cool, dry place, away from heat and dampness. When storing large silk scarves and shawls, roll them on a cardboard tube rather than folding them. Folds weaken the fibers, causing perma­nent creasing and eventual tearing. If folding the silk is unavoidable, use the paper to support the folds to mini­mize creases. Place the layers of silk and paper in a cardboard box or wooden drawer. Never use plastic for long-term storage; it does not allow the natural fibers to breathe, causing them to dry out and deterio­rate. Plastic should be used only to transport silk and to tem­porarily protect work in progress from water spots, dye, grease, and dirt present in a studio situation. If carpet beetles and mice are a problem in your area, peri­odically check your stored silk scarves for signs of these pests. Homo sapiens is not the only species on earth that likes to line its nests with silk. Silk is a beautiful gift from nature that has been cultivated for over 3,500 years and enjoyed for over 4,000 years. From India and China ancient colorants and resist techniques were developed to embellish the silk women clothing and silk scarves and shawls. The wax resist techniques of India have been documented back to the second century A.D. and 200 years later the wax techniques filtered into Java, which became the center of the batik industry. Gutta is probably a more recent development in the history of resist techniques, but the origin of the craft remains something of a mystery. One could surmise that the craft has its origins in the Indonesian islands, where the pallaquium tree (from which gutta-percha is obtained) grows naturally. Resist techniques have long been part of the culture and industry of this region. There are a lot of unanswered questions about how the craft of silk painting spread to other parts of the world. Nevertheless, as a team of silk painters we found that it very interesting to know about the more recent developments: how gutta and related techniques of silk painting eventually reached the North America and how this beautiful craft evolved into the diverse medium it has become today. It’s that time of the year where we are all ready to take a vacation; leave our towns or even crash at someone else’s house for a few days to change up your environment. The most we ever think about when planning our trip about what we’re going to do then what are we going to pack and as women get closer and closer to our closet we get the sudden urge to wish we could just carry our closets in little in small fold up and have everything disengage and organize itself like Mary Poppins bag did. But we can’t pack everything we can only pack those things which are essential to our trip and necessities. And sometimes whether man or woman it can be difficult to decipher needs and wants for a 5 day cruise. But for women we try to look for something that would go with anything and still look new. Packing a silk scarf is not only a good idea but it also will show each and every outfit that you wear with a new sense of style and fashion that no one would of think of at first. Have you have ever heard of the hundred way bra or shirt, or anything that was versatile in a way that you can use it over and over again without it being old? It’s easy to pitch this but we know that we can wear a scarf any type of way and still make it look appealing each time and sometimes even brand new. When you pack a silk shawl or scarf such as the ones gorgeously displayed on womensclothingtoday.com, you can use it numerous ways on your trip. It can be used as a headband that floats down you back or you can allow it to hang over one of your shoulders and depending on how you tied it both sides. You can also wear it as a belt even if a belt isn’t needed it can be tied loosely about the waist to accentuate your hips. Another way which is useful is a sarong. Not only with the smoothness against you skin feel pleasant but it can be used to cover up your bikini on the walk down to the pool on your cruise ship. Having a silk printed scarf like those shown in womensclothingtoday.com shows not only elegance but when worn a certain way each time whenever you pair it up with other items in your closet you are able to embrace a sense of casualness and be aware of the many possibilities with in a scarf. Remember when you were younger and you saw the commercials that displayed some new unthinkable toy or putty or jewelry and you wanted it, but your mother always told you no. And if you think about it, it wasn’t always because it was expensive or unnecessary but because it was more than likely something you can do yourself. Products like bedazzle or other infomercials that showed a way to style your jeans or any garment could be easily done yourself. You can purchase a simple rhinestone kit or any jeweled kit for that matter and decorate and design your garments in your own way. Most people would design and focus solely on their jeans, skirts and shorts but one garment that you could jazz up is a sensual silk scarf. If ever you were to purchase a printed silk painted scarf or even fabric that can be used as a scarf you can easily style it up with a few rhinestones and marker. This doesn’t only attract the creative mind but simple styles can be achieved for those who haven’t the talent or the steady hand to draw. Not all of us are gifted in this manner. To make things simple on yourself in styling, yet still adding flare and a sheik look purchase a printed scarf preferably one with a design. You can purchase a rhinestone set almost anywhere such as Michaels, Jo Anne, Target, Wal-Mart, K mart or any store that has an arts and crafts store. Sometimes they can have multiple colors or the simple clear rhinestones. You can also purchase miniature beads for decorating you scarf that also comes in decorative colors. Another set to purchase is shimmer which comes in rectangular tubs in any of the above locations. Although there are numerous other accessories to use these can be the simplest for those who have no experience in designing silk scarves, shawls or shirts. On one garment you can add shimmer; just a small dash. 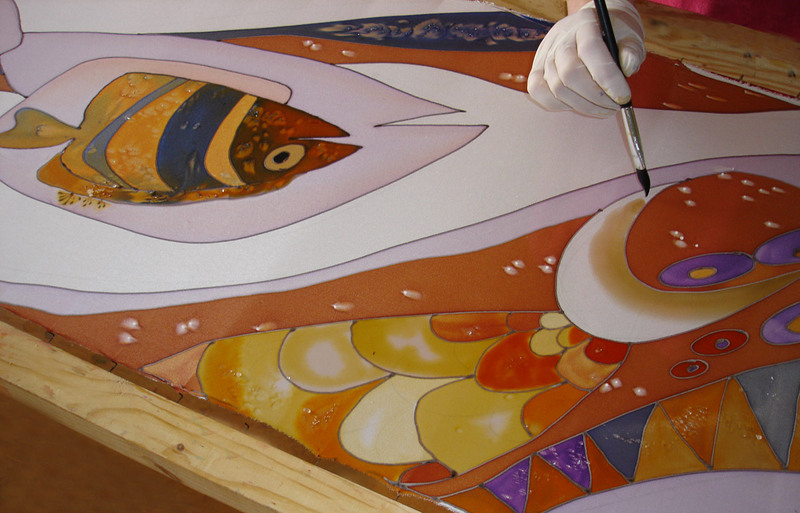 Some shimmer can be adhesive while others would require you to place down a thin layer of clear glue. You can outline the design on the scarf in small parts or you can fill in the design depending on your preference. You can also use the rhinestones to outline or fill in a design to create more glam as well as the beads on your silk shawl or scarf. Your silk scarf can be sensual and seductive and have a bit more of you apart of it. Be sure to take precaution and take your time in adding either beads or rhinestones or shimmer, although you don’t need experience it’s very easy to get the glue in a different place other than where it should be. Silk scarves are very delicate be sure not to rub the glue in too roughly so not to damage it as well. Just by outlining and filling in certain parts of your scarf you can create a glamorous item or make something out of fabric that you’ve had sitting your closet for years. If you don’t know where to begin visit womensclothingtoday.com, to view some of their elegant scarves. Summer is here and we don’t need a weather man to tell us that. Living on the West Coast the heat can almost be unbearable and for women we look for countless ways to keep cool especially when it comes to clothing. Some women opt to wear less, while others opt to wear what’s cool and comfortable. But one garment that allows you to stay cool and adds flare is a silk scarf. Silk has light air and elegance that has a way of cooling and catching a breeze in the most heated of evenings. For those nights that seem never to cool down silk has a way of cooling the nights and not only can it keep you cool but it gives you a sense of appeal and creativity on hot summer nights. You can commonly wear a silk scarf about your neck but it would look even more appealing if it is tied around your head as a head band while the tails hang in the back or you can tie your silk scarf into a bow or a knot so as to not have them hanging. Printed silk scarves that have grace and flare at the same time can be hard to come by but at womensclothingtoday.com you can find sensual silk handmade scarves that can cater to anytime of the season whether it be a hot summer night or the coldest day in December. Silk provides a smooth and soft sensation that can collect moisture without going stiff or making the material clam or clump up. With handmade printed scarves you can also find that it can go with just about anything in your closet. Looking at some of the women on womensclothingtoday.com you can see women wearing different shades of jeans and even wearing the most relaxing hair do’s. Another great fact about silk printed scarves is that they are easy to clean and don’t require much work. Most handmade things should be taken care of with a lot of care but say your coming in from a warm evening and your drink spilled on your scarf, just by taking a mild amount of baking soda or a dab of washing detergent and hand washing it, by morning the silk scarf will be like new. So not only can it cool but it can also be easy to clean and ready to use the next morning. Most would think of silk handmade scarves to be only useful for eventful evenings such as dinner parties or special occasions when in actuality you silk scarf can be used to cool you off and even warn on a every day basis to kick up your outfit and even dress down you accessories. Silk scarves are not only to be seen as sensual seductive wear but also accessories to compliment a woman’s features.